Sitting in the living room of his Rockville Centre home, Frank Scafuri tilts his head back and calls to his digital assistant. "Alexa! Play 'A Small Town Christmas' by Frank." The original version of "A Small Town Christmas," written by Frank Scafuri, was tucked away for 45 years. Photo Credit: Newsday/J. Conrad Williams Jr. 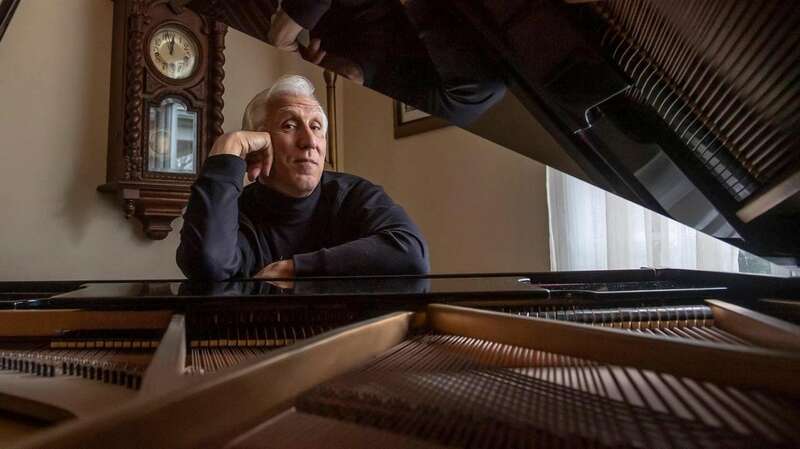 It's Scafuri, doing at 68 what he's wanted to do since he was the 18-year-old star soloist of the Lynbrook High School choir: singing his own song. But in this case, one he wrote long before Alexa, Amazon or digital music existed. It was a spring morning in 1973 when Scafuri sat down in a practice room at the Juilliard School and began working out an idea for a composition inspired by the home his parents were building in the rural upstate town of Windham. "They planned to retire there," recalls Scafuri, who had gone from Lynbrook High to the prestigious Manhattan school for the performing arts. "I'd go up there to see the progress on the house." While there, he'd walk through the woods surrounding the property. "I loved the quiet and peacefulness," he said. "I'd sing in the woods." He particularly loved it around the holidays — and that's the feeling he tried to capture in his song. "A Small Town Christmas," a slow, jazzy melody in C major, extols the rustic beauty of Windham (in the Catskill Mountains) and the wildlife encounters he had in the wintry woods; a place, he sings, "where snowdrifts lie, a fawn lay nestled by its mother's side." 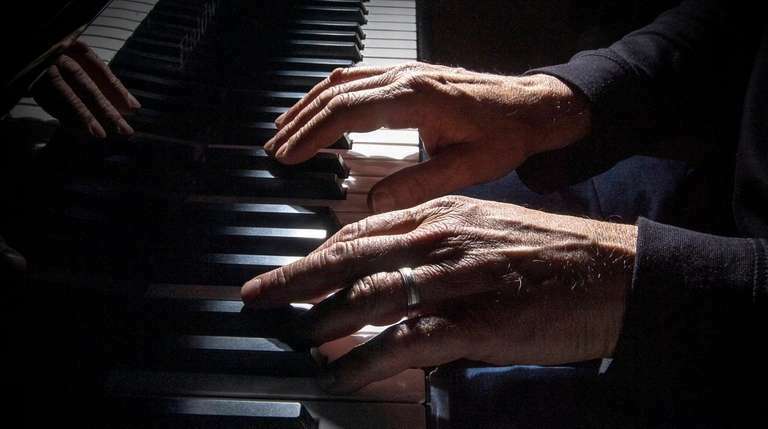 Frank Scafuri plays the piano at his home in Rockville Centre in November. He keeps his voice in shape with half-hour to 45-minute practice session several times a week. Photo Credit: Newsday/J. Conrad Williams Jr.
Scafuri, then a senior at Juilliard, said he imagined his idol, Dean Martin, singing the song, which, he says, "is about the simple things Christmas is supposed to be." But Scafuri knew the odds of getting his song in front of Martin, Perry Como or any of the other big crooners of the day were slim to none. He needed to get on with his life. 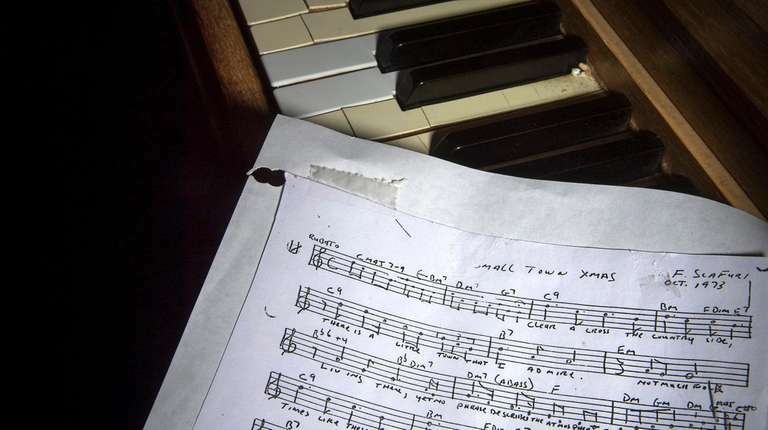 He stuck the hand-notated sheet music in a file with other memorabilia from his college days. "A Small Town Christmas" lay dormant for 45 years. Now, in the kind of dramatic, heartwarming plot twist typically found in … well, Christmas stories, the song has unexpectedly found new life: A lushly produced, 3-minute, 13-second recording of "A Small Town Christmas," with Scafuri singing the lead, is available on Spotify, iTunes, Amazon Digital Music and five other music streaming services. "It's very exciting," he said, even if Alexa and Amazon can't seem to pronounce his last name correctly (it's "ska-fury"); he's written Amazon about the problem, and they're working to fix it, he says. For now, he can command the song by using its title and his first name. After graduating from Juilliard, Scafuri did what most musicians do to make a living: He hustled, singing in wedding bands, performing at senior citizen homes, giving piano and voice lessons. For 40 years, he was a full-time church music director, organist and singer in three different parishes on Long Island and in Queens. While the Christmas song languished in his desk drawer, its lyrics became more ironic as the years went on. Scafuri’s father died of cancer at age 52 in 1977, and the retirement that he and Frank’s mom had envisioned in rustic Windham never materialized. The upstate house was sold in the early 1980s. Connie, Frank's mother, continued to live in Lynbrook until she moved to a nursing home in Hempstead. She died in 2002. In the ensuing years, "A Small Town Christmas" was not entirely forgotten by its composer. About eight years ago, Frank's wife, Mary Ann, heard him playing an unfamiliar melody on a refurbished Baldwin piano in their living room. "I said, 'That's so pretty. Did you write it?' " recalls Mary Ann. "He said, 'Yeah, back in the ’70s.' I said, 'You've got to do something with that song.' "
In fact, it was Mary Ann who spotted the opening that would give new life to "A Small Town Christmas." Earlier this year, she told Frank about an auction to benefit needy families in Uganda. The prize was a one-hour recording session with internationally renowned jazz guitarist John Pizzarelli. The auction began in January and ended at 2 p.m. Feb. 10, a week before a performance by Pizzarelli at Molloy College. "I told him, 'Frank, this is an opportunity,' " recalls Mary Ann. Her husband agreed: He monitored the auction online and five minutes before the 2 p.m. deadline, bid $350. A few minutes later, he got a text. He’d won! And he knew what he wanted to record. “I dug up my Christmas song, made some changes on the lead sheet, filed a revised copyright and sent it to the artistic director of Molloy College, who would forward it to John,” Scafuri says. With the guitarist’s encouragement, Scafuri — who keeps his voice in shape with a half-hour to 45 minutes of practice every other day — shared the guitar-and-vocal recording of his Christmas song with friends, including one of his earliest mentors: Bob Shusterman had hired Scafuri back in the early 1970s for his Dwight Howard Orchestra, a wedding band that had played across the metropolitan area for decades. "Frankie is very talented," said Shusterman, now 78 and living in Merrick. Although he liked the song, he added, "you needed a good producer to showcase that voice." Shusterman put him in touch with veteran producer and arranger John Oddo, who has worked with such artists as Rosemary Clooney. In June, Scafuri booked six hours of recording at Cove City Sound Studios in Glen Cove. Under Oddo's direction, strings, flutes and, yes, a glockenspiel were added. The result: A lush, exquisitely produced holiday song in which Scafuri's still-powerful midrange voice takes center stage. He had his recording, now he needed to get it played: Scafuri immersed himself in the new digital world of streaming music. He found a website that, for a modest annual fee, offers songs to various streaming services. One by one, virtually every major one added the song to its holiday genre. "It's amazing," says Eric Wellman, brand manager of classic rock for iHeartMedia, a streaming service. It is, he said, "not normal, by any means," for an unknown artist to break in that way. Wellman — who was impressed but not involved with Scafuri's holiday song — notes that while algorithms often are used to decide which songs to stream, human ears are still involved in the decision. "Someone had to listen to that song," Wellman said. Although thrilled that it's now available to large audiences, Scafuri realizes that "A Small Town Christmas" is still a musical stocking stuffer compared to the holiday classics. But, demonstrating what he calls his "Italian chutzpah," he's put on his salesman's hat and is pounding the pavement to promote the song this holiday season and presumably in the years ahead. He contacted podcasters who play new music; he sent the song to local and national radio stations; he even emailed the song to 300 metro-area churches, with whom his credentials as a former music minister may help generate interest (or possibly bookings for Scafuri to perform the song live). As of late November, he didn’t know how often the song had been played or downloaded, nor was he certain how much money, if any, he might eventually earn. "If a million people buy it, wonderful," he says. "If they don't, that's OK, too. Maybe someone will hire me to play it live at an event." What's important to him now is the realization of a longtime career ambition. "I said to Mary Ann, 'this is probably my last hurrah,' " he says. "This is the closest I've ever gotten to being this professional, where it's my project, and I'm calling the shots." Mary Ann, who has known her husband since high school, has faith in him — and the project. "He's the most determined person on the planet," she says (the couple have two grown children and two grandchildren). And now that determination — and a little luck — is helping to fulfill a creative dream that began 45 years ago. "What’s better in life than to have your dreams come true?" says his old friend Schusterman. "And to have it happen in the later days of your life, it's even better." There is a little village that I admire. Yet no phrase describes the atmosphere of simple things that mean so much. A fawn lay nestled by its mother's side. As snow sifts through the icy branches where they lie. And there's ol' Frosty standin' tall . . .
Hey it's way too long. And have you felt the crisp cold air? The scent of Old Man Winter is in the air. Oh! And by the way . . .